It’s such a great experience when we get to call one of our loyal customers and let them know that they won a brand new car, courtesy of ADI. 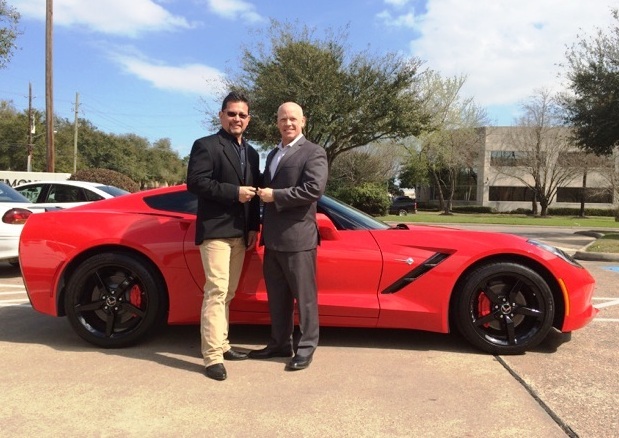 Earlier this week, ADI announced that Ricky Gonzalez, owner of ACI Telephones in Houston TX, won a brand new Chevrolet Corvette through ADI’s Customer Appreciation Car Giveaway Sweepstakes. Ricky is the lucky recipient who was selected from more than 9,000 entry forms received last year through our sweepstakes offering. Ricky has been in the security industry for more than 30 years, and relies on ADI to provide the products and supplies he needs for his installations. Ricky regularly visits the ADI Houston branch, and takes advantage of the all the branch training opportunities available and also attends the ADI Expo each year. We are really excited for Ricky, and hope that he enjoys his new wheels. For the past thirteen years, ADI has been giving away a new car to one lucky dealer. In past years, we have awarded luxury and high performance vehicles including a Cadillac CTS-V, Ford Shelby Mustang, Chevy Camaro, BMW, and Porsche. This year we will be giving away a Dodge Challenger which will be featured in the ADI booth at some of the industry tradeshows during the year, including the upcoming ISC West show this month. You can enter for your chance to win by completing an entry form at the show, or at any local U.S. ADI Expo. Click here for more information and the complete 2015 ADI sweepstakes official rules. This year, ADI and our manufacturing partners will continue the tradition of hosting the best party at the ISC West show in Las Vegas. The ADI Customer Appreciation Event will take place on Thursday, April 16th at the Hakkasan Nightclub in the MGM Grand. Dealers can stop by the ADI booth #12031 at the show to inquire about tickets. Click here to learn more about ISC West, and stay tuned for more information about ADI at the show. Click here for a list of upcoming ADI events. « Are Your Customers’ DVRs and NVRs Working?